Rendering of the new (post-1911 fire) Mont Amoena Female Seminary building by architectural firm Sayre & Baldwin, 1912. Image courtesy of Linda Herring, St. John’s Lutheran Church Heritage Center. Label on the back of the Sayre & Baldwin architectural rendering. It indicates this drawing was used for fundraising efforts. Image courtesy of Linda Herring, St. John’s Lutheran Church Heritage Center. 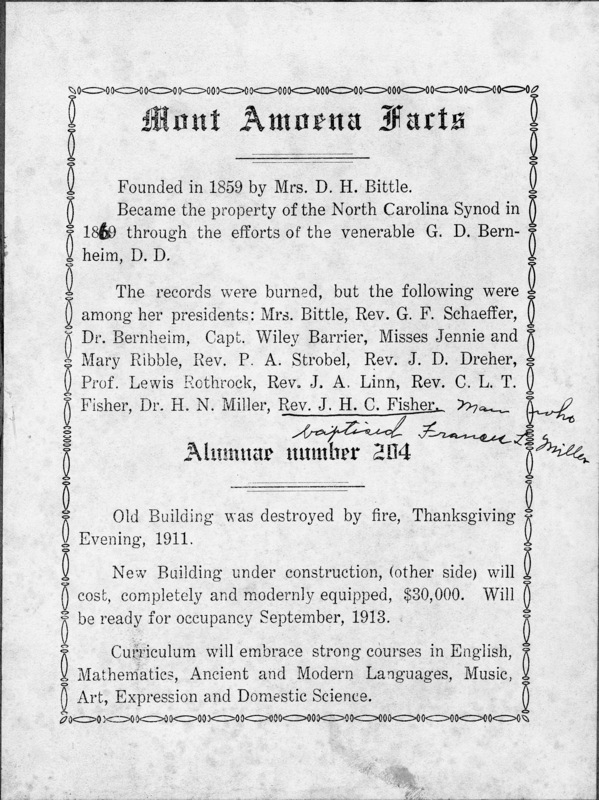 After Mont Amoena Female Seminary burned on Thanksgiving night, 30 Nov 1911, the synod chose architect Christopher Gadsen Sayre to design a new school. Most of Sayre’s schools were of brick with terra cotta or stone trim, two or three stories tall, and usually with double-loaded corridors flanked by classrooms. The largest schools had gymnasiums, cafeterias, auditoriums, and other facilities. The new Mont Amoena Seminary building fit the latter description. It opened 30 Sep 1913. Christopher Gadsden Sayre (November 21, 1876-October 12, 1933) was a South Carolina architect who had extensive work across North Carolina for many years, in partnership with James J. Baldwin and on his own. Although his practice encompassed many types of buildings, he was best known for his public school designs, which included some of the state’s finest public school edifices of the 1910s and, especially, the 1920s. Sayre was born in Mount Pleasant, South Carolina, the son of William and Jane Dewers Gadsden Sayre. He was educated at the Porter Military Academy in Charleston and entered South Carolina College (later the University of South Carolina) in 1894, and received his BS degree from that institution in 1897. After graduating, he went to work in South Carolina in surveying and civil and mechanical engineering, from 1897 to 1906, working under the supervision of Gadsden E. Shand, an architect and engineer with W. B. Smith Whaley and Company, as the firm’s resident engineer at the Ware’s Shoals Manufacturing Company development in South Carolina. The complex, including a cotton mill, canal, dam, and power plant, was completed in 1904. Sayre began an independent practice as architect and engineer about 1905, with offices in Anderson, South Carolina. City directories show him listed there in 1905-1906 as a Civil, Electrical, and Mechanical Engineer, and in 1907-1908 as an engineer and architect, and in later years he typically listed himself as an architect. In 1909, architect James J. Baldwin joined Sayre as an associate, and the firm of Sayre and Baldwin operated for several years in the Bleckley Building in Anderson. The firm expanded its practice into North Carolina by 1909, designing numerous buildings, especially schools, across the state. They opened a branch office in Raleigh in 1914 but dissolved the partnership by 1915. After parting ways with Baldwin, Sayre maintained an office in Anderson through 1931, but he also had offices in North Carolina cities: Raleigh, 1914-1925; Winston-Salem, 1925; Greensboro, 1924-1927; and Asheville, 1926. He resided in Greensboro briefly in 1925-1927, and had his office in the prestigious Jefferson Standard Building, designed by Charles C. Hartmann. Sayre’s architectural practice extended through much of North Carolina, South Carolina, and Georgia through at least 1927, but the preponderance of his work after 1918 was in North Carolina. In North Carolina, Sayre’s practice alone and with Baldwin included projects in 28 counties from west to east. His work included many types and styles of buildings, such as the multi-storied Wilrik Hotel in Sanford, the Moore County Courthouse in Carthage, and the imposing Colonial Revival A. M. Scales House II, with towering Mount Vernon porch, in Greensboro. 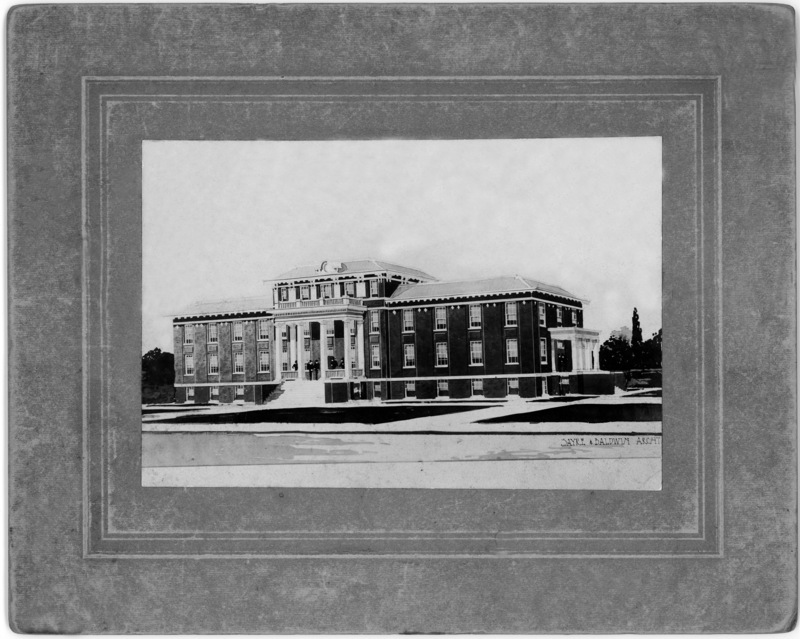 Notably, Sayre also submitted sketches for the Buncombe County Courthouse, a major commission, but the commissioners selected Milburn, Heister, and Company as their architects. Sayre’s specialty, however, and doubtless his principal source of work, was in designing public schools. Sayre became the leading public school architect of his day in North Carolina during a period of unprecedented state and local investment in education. Although other architects designed equally excellent school buildings in the state, such as Hugh White for the Gastonia High School; Hobart Upjohn for the Roanoke Rapids High School; and Douglas D. Ellington for the Asheville High School, and some architects planned a greater number of schools, none equaled Sayre for quality along with quantity. (Sayre had applied for the Asheville project, but Ellington, the local favorite, got the job.) Most of Sayre’s public schools were of brick with terra cotta or stone trim, two or three stories tall, and usually with double-loaded corridors flanked by classrooms typical of the era. The largest ones had gymnasiums, cafeterias, auditoriums, and other facilities. Most of them featured the popular Collegiate Gothic, Tudor Revival, Colonial Revival and classical styles in more or less elaborate fashion and in various combinations. More than 35 school projects by Sayre were mentioned in notices in the Manufacturers’ Record. These ranged from modest buildings to some of the largest and most elaborate public schools in the state. In Raleigh, for example, where he was employed for the city’s full set of public schools, he planned small schools for Pilot Mills and Caraleigh mill villages and also designed the large and handsome Wiley Elementary School and Thompson Elementary School (both for white students); Washington Grade and High School (for black students), and the magnificent and much mourned Hugh Morson High School (for white students), which was among the finest high schools in North Carolina. Known by reputation far and wide, he gained commissions for top-notch public schools in smaller towns as well, such as Claremont High School in Hickory, Boyden High School in Salisbury, Lumberton High School in Lumberton, Warrenton High School in Warrenton, and others. In some cases, Sayre’s drawings served to encourage local support for funding the projects, as was the case for the Lumberton High School. The local Robesonian of February 22 and February 26, 1923, expressed support for the much needed high school, for which a special election was to be held authorizing issuance of bonds of up to $250,000 for the project. The article identified Sayre (of Anderson and Raleigh) as the architect and announced, “Plans and a water-color perspective of the proposed new building will be placed on exhibition so that the people may see just what the school board has in mind.” Water color perspective drawings, a medium mastered by most successful architects, were frequently used to convey to clients what their proposed building might be, and often to persuade them to employ the architect or pay for the building. Sayre was among the first architects licensed to practice in North Carolina. His license certificate, issued in 1915, was #40 in the official registration book of the North Carolina Board of Architecture. Sayre was also involved in the burgeoning textile industry and was president-secretary of the Anderson Hosiery Mills in Anderson, South Carolina in 1925-1931. He died in Anderson on October 12, 1933. His son, Christopher Gadsden Sayre, Jr., moved to Texas, and had a son by the same name; family members still live in Texas. Because of their extensive usage of the Manufacturers’ Record, Sayre and Baldwin and Sayre alone have an unusually large number of unconfirmed buildings. Only those that have been confirmed as built are included in the building lists. During Sayre’s association with Baldwin, the firm reported many building designs to the Manufacturers’ Record, chiefly when the firm had proposed or completed plans. Some were identified by name and location, but whether they were built or whether they still stand has not been determined. Anson County, Wadesboro, Anderson Sanitarium Building (MR 6/19/1913); Cabarrus County, Mount Pleasant, Mont Amoena Seminary Building (MR 7/18/1912); Gaston County, Gastonia, Mrs. E. C. Wilson House, “colonial style dwelling” (MR 12/30/09); Johnston County, Smithfield, Bank of Smithfield (MR 5/22/1913, 6/19/1913); Johnston County, Smithfield, Cotter-Underwood Store Building (MR 5/22/1913 and 6/19/1913); Lee County, Sanford, First Methodist Church (MR 6/6/1914); Randolph County, Asheboro, Randolph County Jail (MR 8/13/1914); Rutherford County, Rutherfordton, Dr. Henry Morris Hospital (MR 9/15/1910); Transylvania County, Brevard, Brevard Institute Girls’ Dormitory Remodeling (MR 12/4/1913). Others were noted only by type and location: School, Concord, Cabarrus County (MR 7/9/1914); School, Bessemer City, Gaston County (MR 7/24/1913); School, Canton, Haywood County (MR 4/15/1909); Graded School, Kenly, Johnston County (MR 6/19/1913); School, Franklin, Macon County (MR 6/24/1909); School, Rutherfordton, Rutherford County (MR 6/30/1910); School, Marshville, Union County (MR 9/9/1909, 12/2/1909). After Sayre went out on his own, he continued to send notices of his work to the Manufacturers’ Record on a regular basis. Bladen County, Bladenboro, School, 1917 (MR 2/22/1917); Buncombe County, Asheville: First Christian Church, 1925, Oak St. (MR 1/1/1925), Mountain Street School, 1925, Mountain St. (MR 7/23/1925), Chateau LaFayette Hotel, 1926, Stradley Mountain Park (MR 4/15/1926), West Asheville Presbyterian Church (MR 11/17/1921, and 5/25/1922), West Asheville High School (MR 7/23/1925), Eugene Rankin School (MR 11/26/1925); Catawba County, Hickory, Teacherage (MR 7/19/1923); Hoke County, Raeford, Presbyterian Church, 1921 (MR 9/8/1921); Johnston County, Clayton, Baptist Church, 1919 (MR 6/12/1919); Polk County, Columbus, School, 1916 (MR 7/20/1916); Randolph County, Ramseur, School, 1921 (MR 7/7/1921); Robeson County, Fairmont, School, 1921 (MR 3/10/1921, 3/7/1921); Robeson County, Maxton, School, 1916 (MR 1/27/1916, 2/24/1916, 3/9/1916); Swain County, Bryson City, School, 1922 (MR 8/24/1922); Wake County, Raleigh, Caraleigh School, 1924 (MR 7/31/1924), and Pilot Mills School, 1924 (MR 7/31/1924). Further information is sought on these and other Sayre works. Not all projects cited in the Manufacturers’ Record as planned by a firm were actually built, or built from that firm’s designs. Only those whose status has been confirmed are included in the building list. Source: Wells, John E. Update: Catherine W. Bishir. North Carolina architects & builders : a biographical dictionary, North Carolina State University Library, 2009. http://ncarchitects.lib.ncsu.edu/people/P000086.